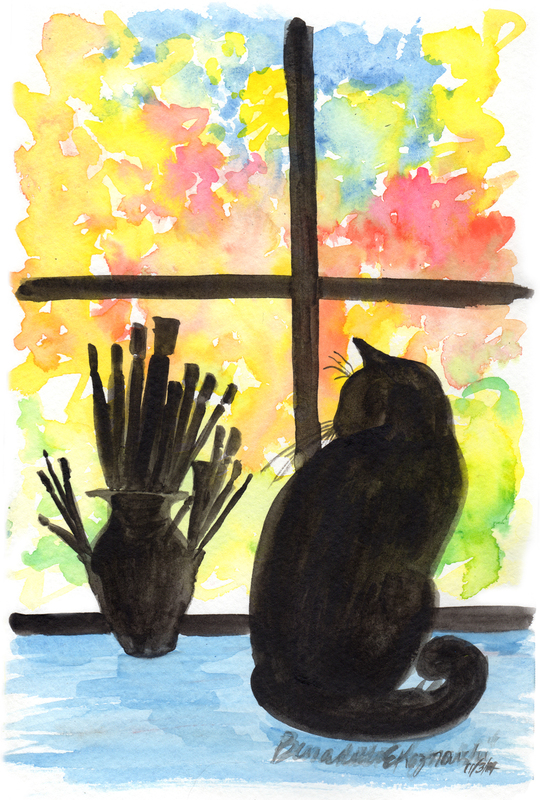 Studio Window, Autumn, Watercolor, original art is 5.5″ x 8.5″ ink and watercolor pencil on 40lb. watercolor paper, prints are made in archival inks on Epson Velvet Art Paper, Cold Press Digital Giclee Paper or Artist Canvas. The original sketch is in on 40 lb. watercolor paper tinted with watercolor pencil and toned with washes of clear water. The original is matted with a cream black core top mat and a red black core bottom mat, framed in an 11″ x 14″ white wood frame 1.5″ wide.